Molift Quick Raiser 205 is a state of the art sit-to-stand hoist, with an electrically adjustable leg base and an outstanding lifting capacity. The standing hoist is comfortable, stable and safe with exceptional manoeuvrability. Quick Raiser 205 is compact, stable and exceptionally easy to manoeuver. The unique wheel position, angled push bar and the extraordinary weight distribution of the base provides a small turning radius and easy manoeuverability even in very narrow spaces. With the small castor option, it fits under most beds and chairs while the electrically adjustable legs enables accessibility almost everywhere. The fixed-leg option benefits a very small footprint. The Active Lifting Arm (four point sling bar) and the RgoSling Active provides extra support when hoisting from sit to stand. The inclined column encourages a natural pattern of movement and fulfills the hoisting needs of users with some weight bearing capacity. The Active Lifting Arm combined with the sling provides a comfortable, stable and safe hoisting solution. The slanting column lifts the user up and forwards to imitate a natural movement pattern. The Active Lifting Arm (4-point sling bar) and the RgoSling Active provides extra support when hoisting from sit to stand. Automatic warning for (annual) periodic inspection and service. 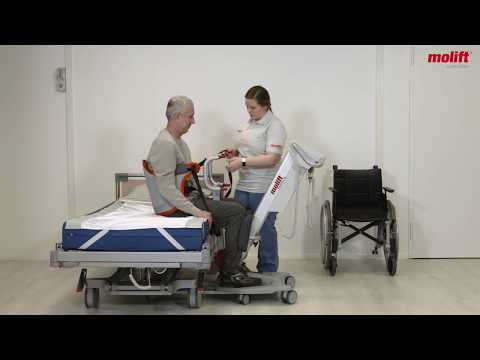 Easy to operate in moving and handling situations; toilet, sit-to-stand and stand-up training. Ideal to use with RgoSling Standup slings. This accessory benefits a 10 cm (4inch) elevated footrest. The attachment key is easy accessible and makes it convenient to lock or unlock the accessory to the Quick Raiser. Inlays with slipresistant material to increase friction. Only contains cushions, no leg straps.